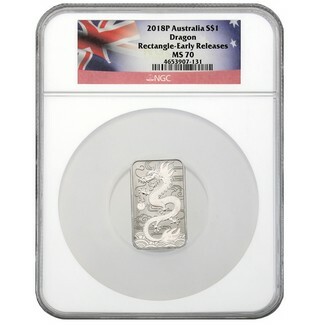 This majestic coin features a Chinese dragon with a unique rectangular design. The limited mintage Dragon coin features a worldwide mintage of 500,000 coins and .9999 fine Silver. Obverse: Bears the Ian Rank-Broadley likeness of Her Majesty Queen Elizabeth II, the face value, year-date, weight, and fineness. Reverse: Features a stylized Chinese dragon chasing a flaming pearl, with wind, clouds and water in the background. The design also includes The Perth Mint's "P" mintmark.